DRIVING examiners have won their fight for a €250 a month net pay increase after nearly a year of intermittent industrial action forcing nearly a quarter of a million tests to be cancelled. 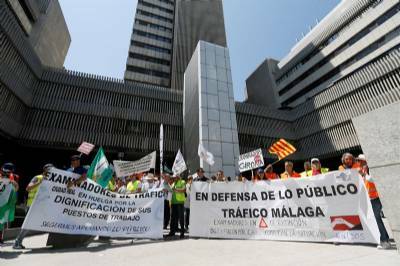 Opposition members in Parliament – Ciudadanos, the PSOE (socialists) and Unidos Podemos – backed a budget amendment of €3 million to meet examiners’ demands, which involved having to cut the same amount of funding from the ‘research and technical work’ section of the traffic authorities’ annual spending. The Association of Road Traffic Examiners (ASEXTRA) called off its series of strikes in December, having downed tools three days a week for the previous five months. Their cessation of industrial action was based upon a joint pledge between the three main opposition parties plus other key regional outfits – the Basque National Party (PNV), the Catalunya Left Republicans (ERC) and the Democratic Party for Catalunya (PDeCAT) – to push for the extra €3m to be made available for salary increases. ASEXTRA threatened to resume its strikes if these promises did not bear fruit. The right-wing PP, which is currently in power but in a minority, had been opposed to the pay increases, but were forced to concede amid pressure from the majority in opposition. Public sector workers’ union CSI·F reacted positively to the news, praising the ‘efforts and consistency’ of the examiners for not letting up until their voices were heard, but criticising the PP and opposition for taking so long to act. These delays, they said, meant strike action which could have been prevented continued, and forced 66 driving schools to close down for good in the first 10 months of last year. Pupils were starting to give up their lessons as they were unable to continue paying for them indefinitely without a test date in sight. Over 170,000 pupils last year alone were unable to take tests they were more than ready for, or retakes they were fired up for given that the average first-time fail rate in Spain is around 73%. CSI·F spokespersons say they will keep monitoring other public sector industries to ensure that working conditions improved across the board. Protests across the country are scheduled for this coming Monday, May 21 in which public sector employees will be calling for better conditions, a minimum full-time take-home wage of €1,200, and a professional qualifications network.